Citation: C N Trueman "Changi POW camp"
Changi was one of the more notorious Japanese prisoner of war camps. Changi was used to imprison Malayan civilians and Allied soldiers. The treatment of POW’s at Changi was harsh but fitted in with the belief held by the Japanese Imperial Army that those who had surrendered to it were guilty of dishonouring their country and family and, as such, deserved to be treated in no other way. For the first few months the POW’s at Changi were allowed to do as they wished with little interference from the Japanese. There was just enough food and medicine provided and, to begin with, the Japanese seemed indifferent to what the POW’s did at Changi. Concerts were organised, quizzes, sporting events etc. The camp was organised into battalions, regiments etc and meticulous military discipline was maintained. However, by Easter 1942, the attitude of the Japanese had changed. They organised work parties to repair the damaged docks in Singapore and food and medicine became scarce. More pointedly, the Japanese made it clear that they had not signed the Geneva Convention and that they ran the camp as they saw fit.For this reason, 40,000 men from the surrender of Singapore were marched to the northern tip of the island where they were imprisoned at a military base called Selerang, which was near the village of Changi. The British civilian population of Singapore was imprisoned in Changi jail itself, one mile away from Selerang. Eventually, any reference to the area was simply made to Changi. As 1942 moved on, death from dysentery and vitamin deficiencies became more common. The mood of the Japanese changed for the worst when a POW tried to escape. The attempt was a failure and the Japanese demanded that everyone in the camp sign a document declaring that they would not attempt to escape. This was refused. As a result, 20,000 POW’s were herded onto a barrack square and told that they would remain there until the order was given to sign the document. When this did not get the desired result, a group of POW’s was marched to the local beach and shot. Despite this, no-one signed the document. Only when the men were threatened by an epidemic, was the order given that the document should be signed. However, the commanding officer made it clear that the document was non-binding as it had been signed under duress. He also knew that his men desperately needed the medicine that the Japanese would have withheld if the document had not been signed. But this episode marked a point of no-return for the POW’s at Changi. The Japanese used the POW’s at Changi for forced labour. The formula was very simple – if you worked, you would get food. If you did not work, you would get no food. Men were made to work in the docks where they loaded munitions onto ships. They were also used to clear sewers damaged in the attack on Singapore. The men who were too ill to work relied on those who could work for their food. Sharing what were already meagre supplies became a way of life. The number of POW’s kept at Changi dropped quite markedly as men were constantly shipped out to other areas in the Japanese empire to work. Men were sent to Borneo to work, or to Thailand to work on theBurma-Thai railway or to Japan itself where they were made to work down mines. They were replaced by more captured soldiers, airmen and sailors from a variety of Allied nations. Malaria, dysentery and dermatitis were common, as were beatings for not working hard enough. In 1943, the 7,000 men left at Selerang were moved to the jail in Changi. It was built to hold 1,000 people. The Japanese crammed in the 7,000 POW’s, five or six to one-man cells. With such overcrowding, the risk of disease and it spreading was very real. Very little arrived from the Red Cross and the men at Changi had to rely on their own initiative to survive. For example, the army medics at Changi made tablets and convinced the Japanese guards that they were a cure for VD, and accordingly sold them to the guards. They could then buy proper medicine for their own men in an attempt to aid those who were sick. 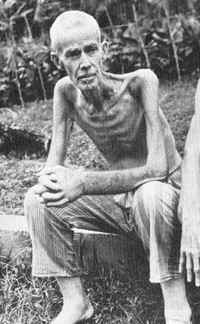 As the end of the Pacific War approached, rations to the POW’s were reduced and the work requirement increased. POW’s were made to dig tunnels and fox holes in the hills around Singapore so that the Japanese would have places to hide and fight when the Allies finally reached Singapore. Pay for this work was increased to 30 cents a day – but one coconut cost $30. Many POW’s believed that the Japanese would kill them as the Allies got near to Singapore. This never happened. When Emperor Hirohito told the people of Japan that the war ‘has gone not necessarily to our advantage’, the Japanese soldiers at Changi simply handed over the prison to those who had been the prisoners. To these soldiers, they were simply obeying an Imperial order and were not disgracing their families or country. When Lord Mountbatten arrived in Singapore, he was joined by RAPWI – ‘Rehabilitation of Allied Prisoners of War and Internees’. The Americans were the first to leave Changi. Those remaining christened RAPWI ‘Retain all Prisoners of War Indefinitely’. When men were repatriated they went to either Sri Lanka orAustralia to convalesce.